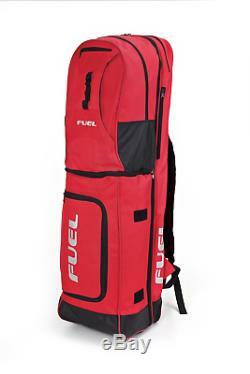 New FUEL 3 in 1 Hockey Stick Bag The Jerry Can MK2 RED. Choose from four different colours - Black, Red, Navy and British Racing Green. The day bag (ruck sack) with double padded shoulder straps is large enough for kit, shoes and shin pads if you dont want to take the whole bag. NOW WITH STICK HOLDER for an easier ride. There is a nylon strip on the front of the bag where you can attach anything with a carabiner. The weekend duffle bag has extra grab straps so that it can be carried from the top or side and is big enough for a weekend away. Inside a zipped mesh top pocket keeps you valuables separate from the main bag. NOW WITH MOVABLE DIVIDER so you can keep your smelly stuff away from your clean gear. The stick bag has an iPad size pocket for all those items that are, well, the size of an iPad. It also has two sections for your sticks so that you can carry as many sticks as you need without them clanging together. 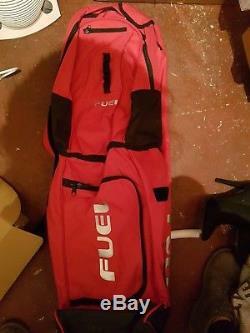 When the bag is assembled using the FUEL quick zip system you have a large stick bag with the capacity for all your kit, astros, valuables and sticks. With 4 extra pockets and 3 different sections it is easy to keep your entire hockey gear to hand and separated. Whether you use the bag as one or utilise all the sections for different events The Jerry can is the most versatile hockey kit and stick bag available. Your order will be delivered between 8am and 8pm, Monday to Saturday. We are unfortunately unable to specify the time at which the goods will be delivered to you. Bank Holidays resulting in limited to no courier services for that period. 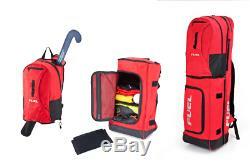 The item "New FUEL 3 in 1 Hockey Stick Bag The Jerry Can MK2 RED" is in sale since Sunday, January 14, 2018. This item is in the category "Sporting Goods\Hockey".store87" and is located in West Bromwich.